Ted Cruz endorsed Donald Trump for the presidency Friday afternoon, a stunning turn of events after a contentious primary filled with nasty personal attacks and a dramatic snub at the Republican National Convention. 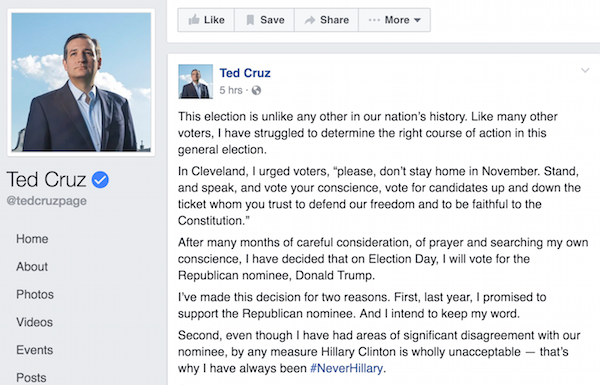 “After many months of careful consideration, of prayer and searching my own conscience, I have decided that on Election Day, I will vote for the Republican nominee, Donald Trump,” Cruz wrote in a Facebook post. However, it wasn’t everything it was made out to be. Just hours later, Cruz took the podium in Memphis, Tennessee to discuss his “change of heart” to a crowd of Trump supporters. 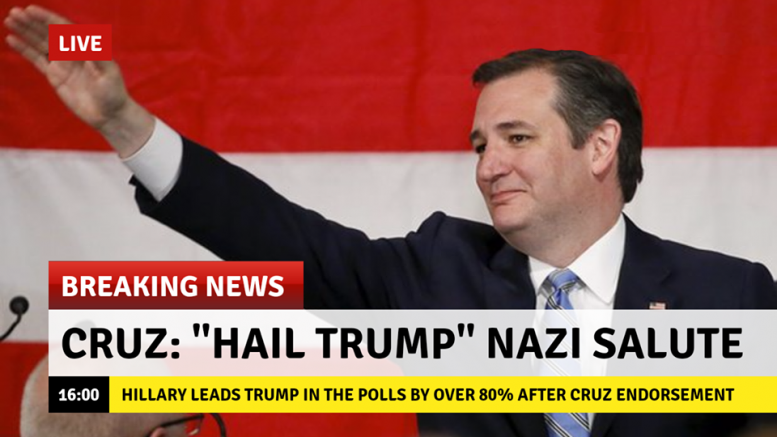 With live media cameras fixed on him, Ted Cruz shockingly raised his hand with a Nazi salute yelling “Hail Trump,” with a grin on his face he couldn’t seem to control. But it did not seem to faze the Trump supporters in attendance, as they cheered him on for a lengthy 7 minutes.